In skillet melt butter or margarine, blend in mustard, then the corn syrup. Slash each frankfurter diagonally in three places (do not cut through frank). Add franks and apples to mixture in skillet. Cover and simmer over lowe heat 10 to 15 minutes or till apples are tender and hot. 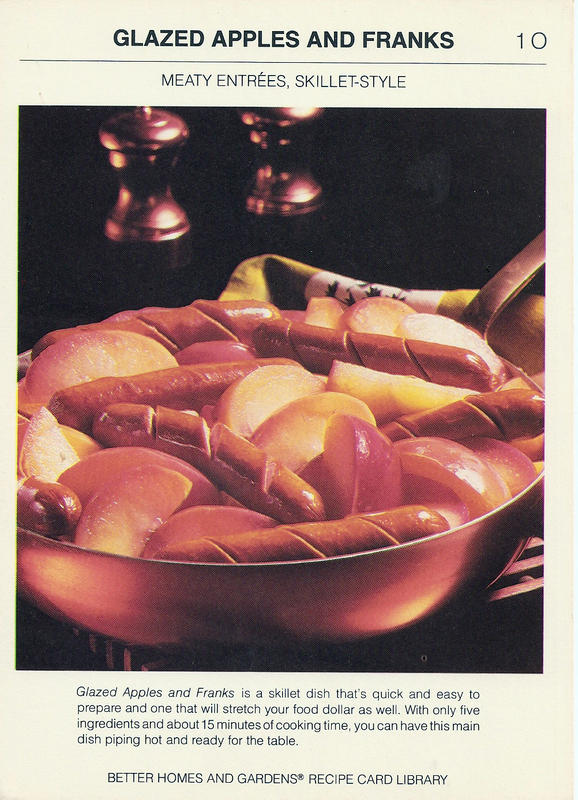 Turn apples and franks once during cooking to glaze. Serves 5. In skillet brown luncheon meat cubes in butter. Drain pineapple, reserving 3/4 cup syrup. Add pineapple, reserved syrup, rice, peas, and dillweed to skillet. Cover the skillet; reduce heat and simmer 4 to 5 minutes or till peas are tender. Stir in tomatoes. Top with sour cream. Cover and simmer the rice mixture 2 minutes more or till tomatoes are hot. Makes 4 to 6 servings. >hr>©Meredith Corporation, MCMLXXVIII. All Rights Reserved. Printed in U.S.A.